﻿ HuntingNut » Forums » General » General » Keep Out !!! Posted: Thu Jun 21, 2018 6:48 am Post subject: Keep Out !!! Posted: Thu Jun 21, 2018 5:23 pm Post subject: Re: Keep Out !!! yip that gets message across.a pile of rocks with plaque reading..."herein lies the last person who forgot to close the gate"
Posted: Sun Jun 24, 2018 5:55 am Post subject: Re: Keep Out !!! Posted: Mon Jun 25, 2018 10:29 am Post subject: Re: Keep Out !!! Posted: Wed Jul 18, 2018 10:54 am Post subject: Re: Keep Out !!! I want that sign. Caught two poachers so far this year on the backside of my property. Posted: Wed Jul 18, 2018 12:03 pm Post subject: Re: Keep Out !!! might be time to do the strategic wee 7' long piles of rocks beside the sign too... aint it funny how this thread was up and then it happened to be a couple of rhino poachers got eaten..... well funny for me but not to amusing for them fellas I guess. Posted: Wed Jul 18, 2018 4:25 pm Post subject: Re: Keep Out !!! 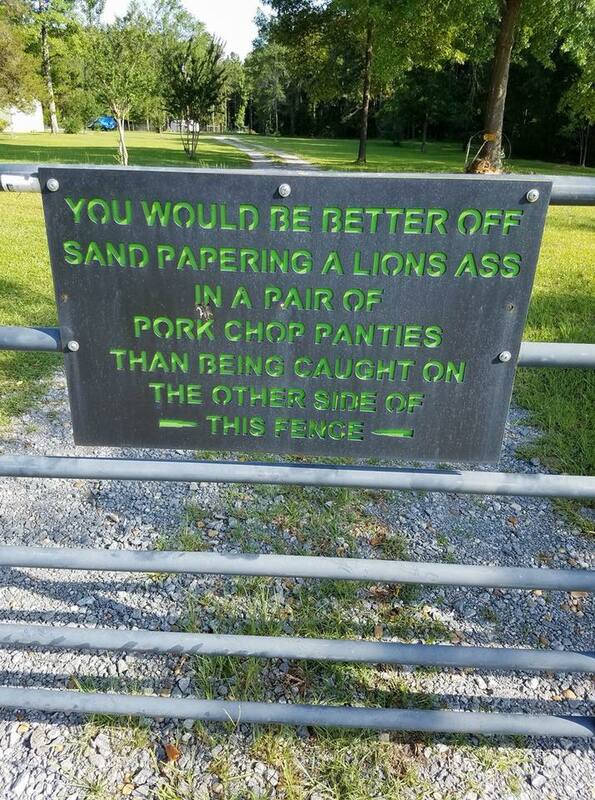 I like the sign but I wonder if it would be considered a valid "no Trespassing" sign. THIS AREA IS RESTRICTED TO AUTHORIZED PERSONNEL WITH WRITTEN PERMISSION ONLY. Trespassers will be charged $1200.00 per day or any part thereof. This charge is in addition to any fine and or imprisonment in civil or criminal procedures that result. or tenants and criminal proceedings will follow.